The world is good again! Last weeks Thursday I walked into an Elisa store and ordered myself a new computer. As you know my old iMac from 2011 decided to give up a while back and all I have had to use was my old laptop which is just not good anymore. It does work but it has been a pain in the bum. So after a lot of thinking I finally decided to bite the bullet and order a MacBook Pro from Elisa. It is an expensive laptop and I am going to pay for this for the next 3 years but so far I do not regret my decision at all. I was such a happy little girl when I got the message that I could pick it up and I did force poor W to come with me to get it right as we got off the ship (we were on a cruise during the weekend). I just couldn't wait to get my hands on it! 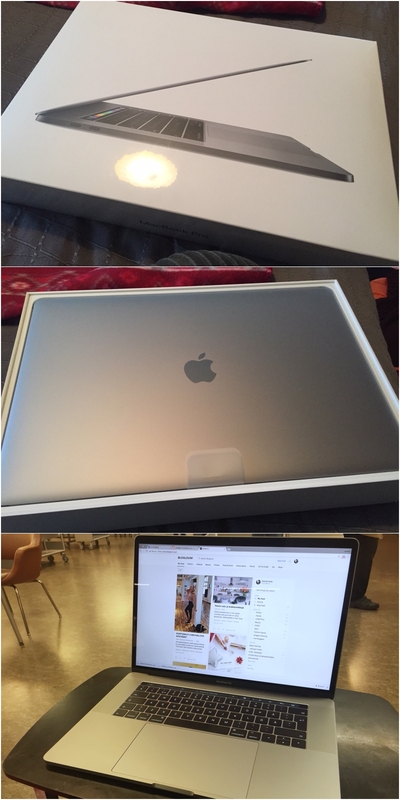 It is the 15" Space Grey one and it is such a beauty to use. This is also the model with the touch bar and I have to say that I am a huge fan of it, even if I thought it was a useless feature when I first heard of it. The huge trackpad is also such a pleasure to use and I have not once hoped to have a mouse which is big since I have hated trackpads before. Not even when I was editing a video, and I mean that is pretty huge. I feel like the blogging game is gonna take a whole new level with this since I can take everything with me and blog anywhere now. I am so excited! I still need to buy a backpack and figure out if I want to keep my table now that I have a laptop which I could use on the kitchen table if I want to. We shall see what I do.